So how do you get started with a book trailer?? There are many different ways to do this based on the type of novel you are promoting and who your target audience is. ?I actually created two book trailers, so I will share with you my experience and what I learned from start to finish.? The first thing I did was research.? I looked at?various author book trailers that could typically be found on their website as well as on YouTube.? I tried to stay within my novel’s genre, which is fantasy YA, so I looked at authors such as Rick Riordin, Suzanne Collins and Veronica Roth. I started to imagine the type of book trailer I wanted for my novel.? The next step is finding an editor.? I partnered with the company?Out of Time Productions http://www.outoftimeproductions.com/?who had actually filmed and edited my wedding video.? I was so impressed with the founder Ernie Layug’s work that I asked if he could work with me on this book trailer project.? Not only was he up for the challenge but together we created an amazing trailer using free stock footage and a beautiful?yet suspenseful background music track that we found online.? We did have to purchase the song but there are many different songs available for free or at a minimal cost.? You don’t have to spend a fortune, especially since you will still need to spend money to pay for the editor and production fees.? This first trailer was about?two minutes in length.? I wrote the script and then Ernie?searched for images and/or video that corresponded?with each of the scenes and voiceover.? Think about movie trailers you like and check out other author book trailers to see which will work best for your novel.? My novel, The Hypothesis of Giants, is a fantasy/adventure story so I?wanted to convey a sense of suspense and excitement for the viewer. What Do I Want to Convey to the Audience? Since it has a similar YA dystopian feel to The Hunger Games, I needed to emphasize the primary conflict of the story- Two teenagers on a quest to prevent a cataclysmic event from happening and that they will need each other to survive if they don’t kill each other first. Why Should They Care About The Book?? I want to build an affinity with the local audience. One of the main reasons I chose the local movie theaters to advertise in was to relate with and get the support of my community. Lead Them To a Call To Action- Now that?I have their interest, I need to tell them where they can purchase the novel or find out more information.? ?(i.e. Buy it today on Amazon). Of course if you can’t afford to have a song written for your trailer, or don’t have family connections, no worries.? There are many talented songwriters out there as well as tracks that you can find online that are reasonably priced and in some cases free to use.? Just be sure to read the fine print! So after a month of editng and re-editing the trailer, it was finally ready to be sent to NCM.? I then got a group of friends and fans together and we went to the?Catching Fire? opening?night showing.? 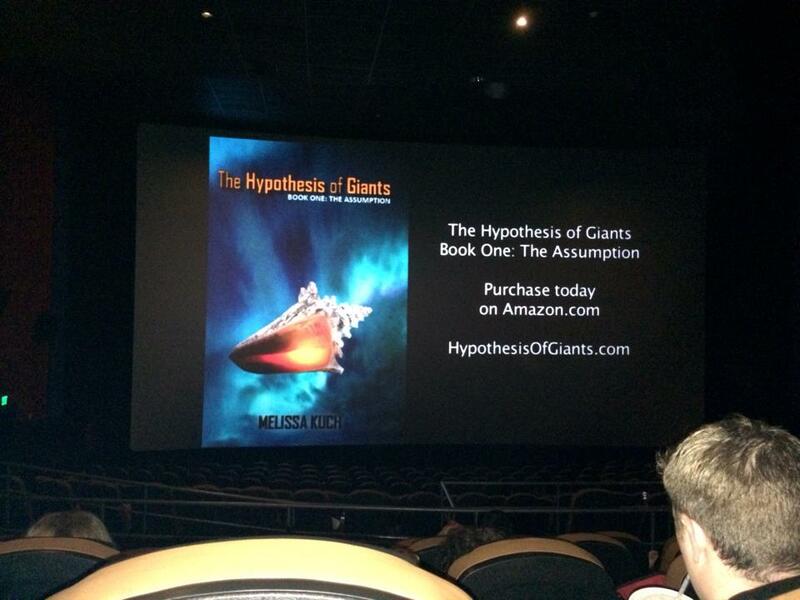 It was such a thrill seeing the book trailer on the big screen and it got a round of applause after it premiered.? Two young girls came up to me and asked me for my autograph, and I felt so honored and proud to be a writer.? Following the movie, we went to a local?lounge and?during a champagne toast?I thanked Ernie,?my family, friends,?and everyone who helped me with creating this trailer as well as for coming out to support my novel!? It was truly a wonderful night and moment in my writing career. Now, before you spend money on advertising in movie theaters, I want to warn you about one thing. ?I thought book sales would skyrocket after the book trailer launched.? I had spent?so much time and money into this trailer, but unfortunately the sales?did not skyrocket.? I did get a few new sales and people interested in the novel, which was great, but not at the level that I was expecting.? ?This is something cool and innovative to spread awareness about your novel, but this tactic is not really aimed at direct response.?? I realized that the trailer only ran for 30 seconds and aired prior to the movie previews when people are talking to friends and not really paying attention.? It was also?mixed in with a multitude of other advertisements.? That is why when you watch TV you will see trailers run in almost every commercial break,?or every other commercial break?because the more times you see a commercial the message will stick.? I could only afford to run it once in the beginning of the movie before the previews and I could not afford to purchase the online re-targeting plan that was available.? Be sure to look into all options before putting your money into this, but at the end of the day I have no regrets.? I have two amazing book trailers that I am very proud of and I can use them for all the reasons I indicated in the beginning of this blog post.? You don’t have to spend a ton of money to promote your novel.? There are many ways to keep the costs down, but my?advice is to make sure you work with people you trust.? ?Ask fellow authors or?find resources?within your network to help you (check out earlier post about building your network). Best of luck to you on creating your book trailer and feel free to share your completed trailer?when you are done.? We are constantly learning from each other, and remember to not get too bogged down on the promoting side of the business.? Keep writing and?your best book is yet to be written!